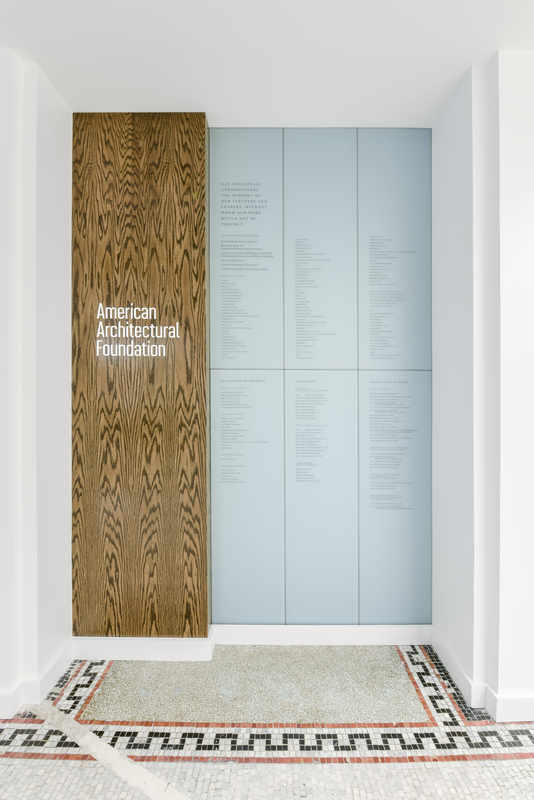 The American Architectural Foundation (AAF) is a proud institution focused on uniting civic leaders and design innovators to create vibrant social, economic, and environmental futures for cities. 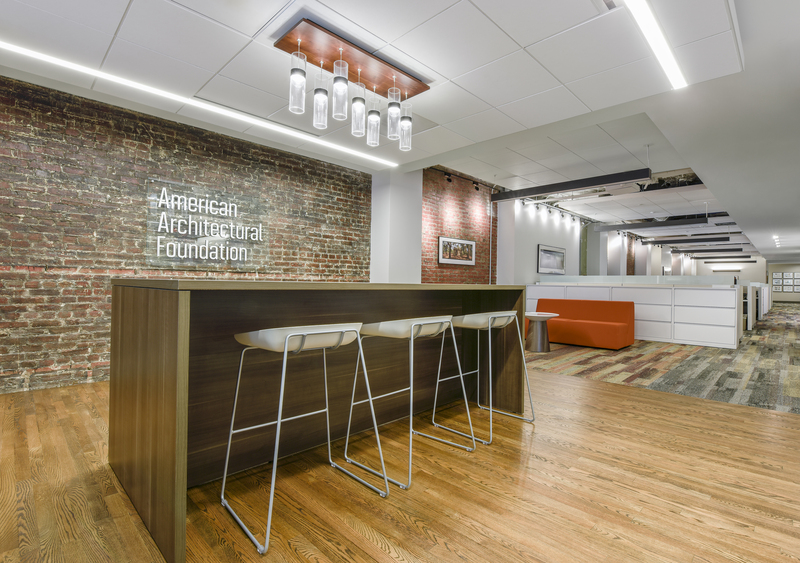 Seeking a new permanent home in Washington DC, the AAF approached our firm to help them review and test-fit three potential spaces for their new headquarters. 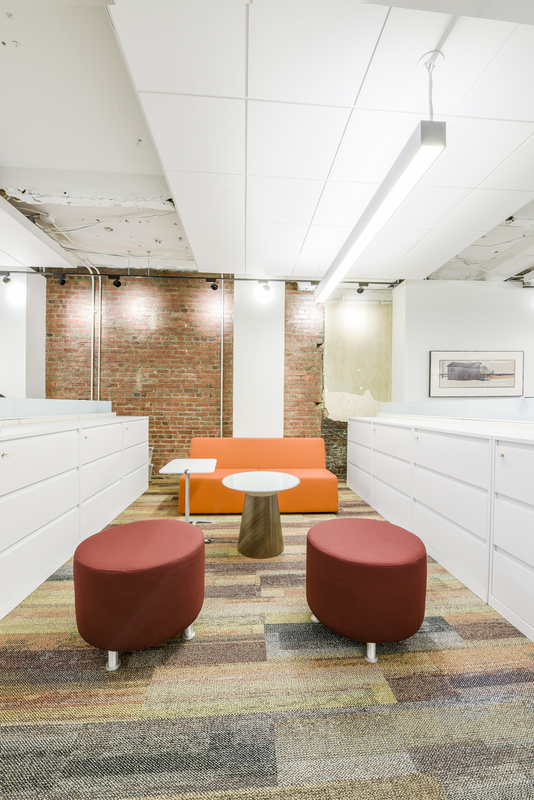 Their goal was to find a multi-dimensional space that could accommodate their day-to-day office functions, host presentations, board meetings and local speaking events, and showcase the work of the AAF and local artists. 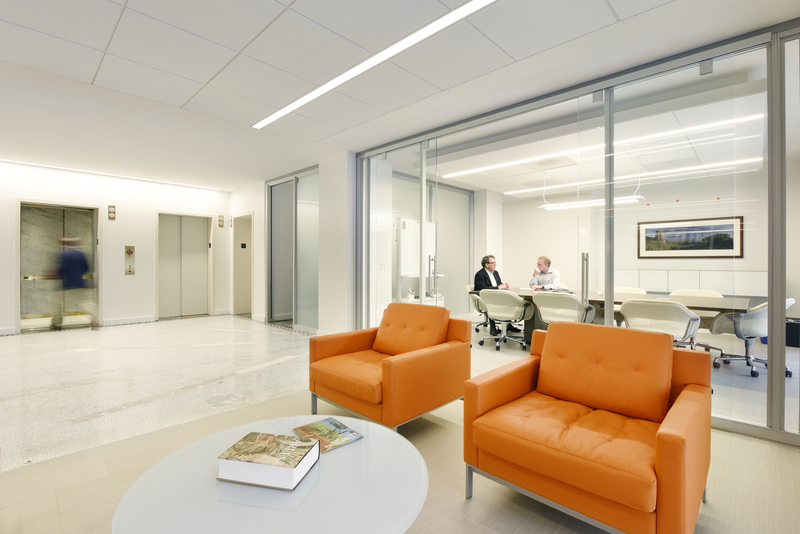 The selected space is located directly above the main entrance on the second floor of the historic American Bar Association building at 15th and H streets, just one block from the White House. 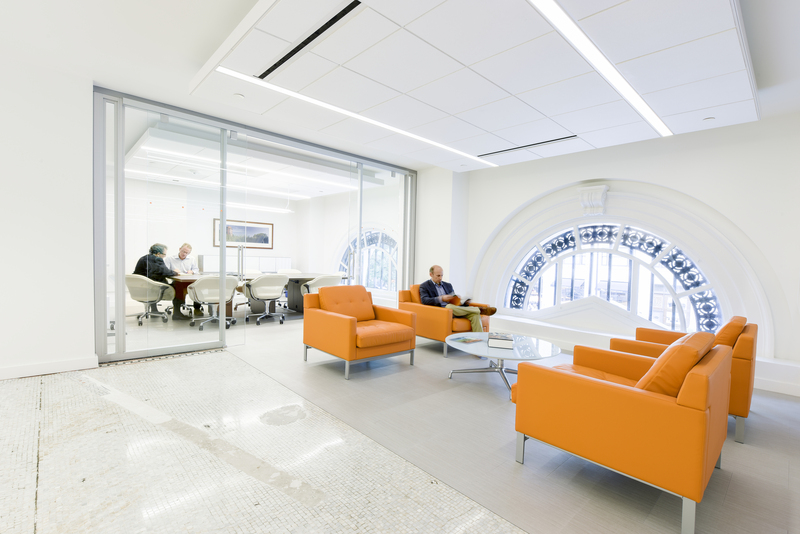 The space is designed to connect the building’s history with modern design. 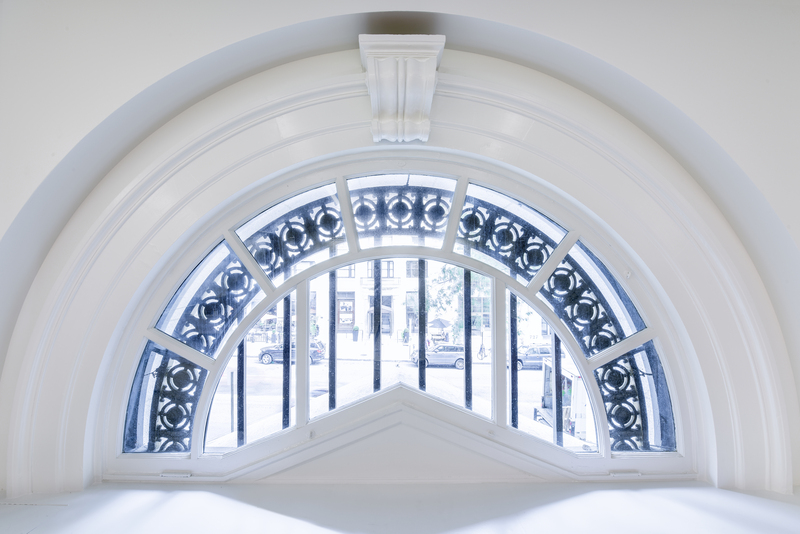 The character of the space offered an opportunity to leave exposed a number of original structural and finish materials of the historic building and offset them with more finished surfaces. 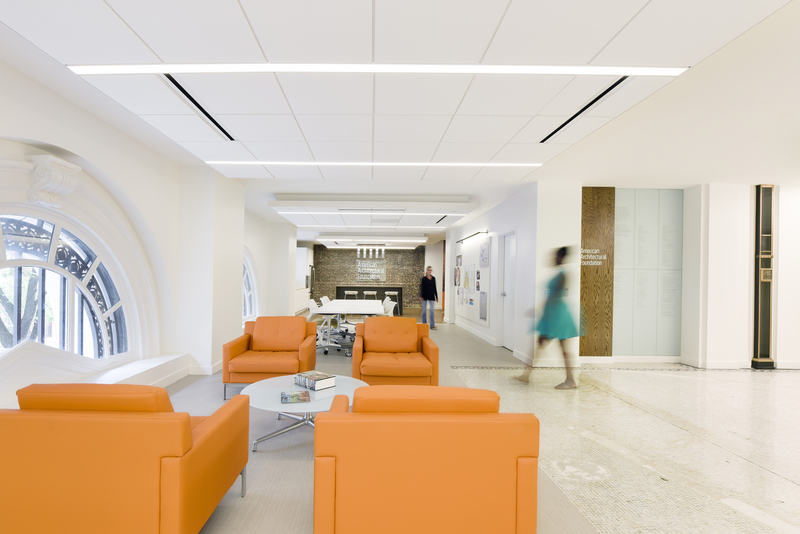 Exposed clay tile structural slabs overhead, mosaic tile at foot, and a brick party wall along the entire east wall provide the counterpoint to acoustic ceiling tile clouds, wood and carpet flooring, and glass wall systems. The existing L-shaped space provides for a natural division of program spaces while maintaining the feeling of a single, unified office. From the elevators that open directly into the reception area – well lit by three floor-to-ceiling arched windows – the spaces progress from public to semi-private to private as one walks a dog-leg to the right. The refurbished mosaic tile floor of the reception area gives way to wood at the ‘Knuckle’, the office café at the bend between the hard-surfaced public spaces and softer private spaces of the open office. 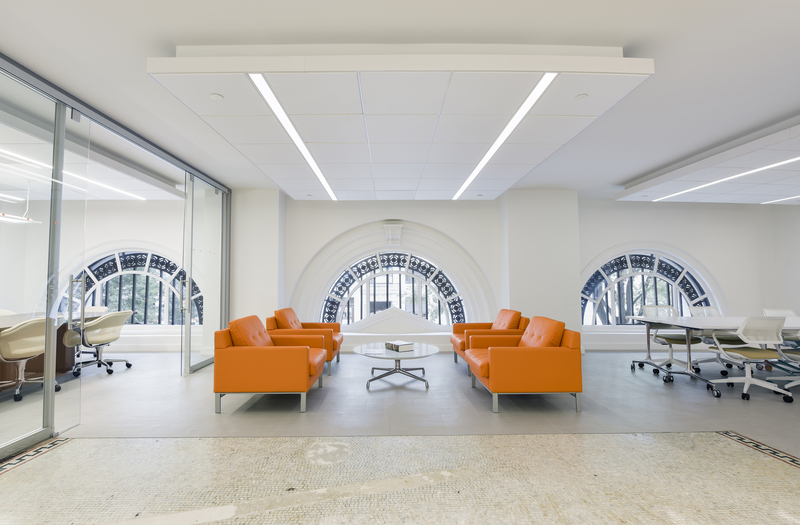 Few partitions were added to the space to allow for the voluminous amounts of natural light at the north and south ends of the space to shine deeply into the office.